Taking in such majestic sites as Rocky Mountains and Yellowstone National Parks, Pawnee National Grassland and visits to Box Canyon for Black Swift and the Mount Evans area for White-tailed Ptarmigan, this popular tour combines tricky species such as rosy-finches, longspurs, grouse and woodpeckers with some of the most stunning scenery in the whole of the USA. Many mammals, butterflies and wild flowers will also be seen. Day 1 Scheduled flight from London to Denver, Colorado, followed by a short drive to Fort Collins for a three-night stay. Days 2–3 We will drive up into the Rocky Mountains National Park. As we rise in altitude we can expect to see Band-tailed Pigeon, Red-naped and Williamson's Sapsuckers, Cordilleran and Hammond's Flycatchers, Clark's Nutcracker, Steller's Jay, Townsend's Solitaire, American Dipper and MacGillivray's Warbler. We will stop along the Trail Ridge Road, above the treeline, to look for White-tailed Ptarmigan, American Pipit and Brown-capped Rosy-finch. As we rise through the various life zones, Golden-mantled Ground Squirrel, Colorado and Least Chipmunks and Yellow-bellied Marmot can be found and, with all this potential prey about, Golden Eagle and Prairie Falcon can be seen as high as the tundra. Some of the lakes in the area have excellent picnic sites with good birding and species we may see at these include Brown Creeper, Golden-crowned and Ruby-crowned Kinglets, Yellow-rumped (Audubon's) Warbler, Dark-eyed (Grey-headed) Junco, Pine Grosbeak, Cassin's Finch and very tame Canada Jays. Both days will be spent in the mountains at altitudes of up to nearly 3300 metres, birding and enjoying the superb views. One evening we may look for Common Poorwill. 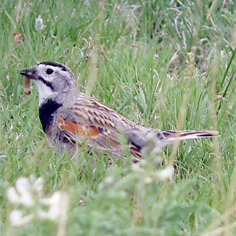 Day 4 Today we will drive through the Pawnee National Grassland, where both Chestnut-collared and McCown's Longspurs breed alongside Horned Larks, Lark Buntings, Cassin's Sparrows and the declining Mountain Plover. Again there will be plenty of mammals about including Pronghorn, Coyote, American Badger, Mule Deer and Black-tailed and White-tailed Jackrabbits as well as Thirteen-lined and Spotted Ground Squirrels and Black-tailed Prairie Dogs, whose holes are sometimes utilised by Burrowing Owls. The small mammals attract birds of prey including Ferruginous and Swainson's Hawks. The gently rolling hills, cliffs and riparian woodland support Great Horned Owl, Common Nighthawk, Eastern and Western Kingbirds, Blue Jay, Northern Mockingbird and Bullock's and Orchard Orioles. We will continue to head north into Wyoming for a two-night stay at Laramie. Day 5 In the morning we will explore another grassland looking for any species we may have missed. In the afternoon we will visit Lake Hattie Reservoir, where we will look for breeding White-faced Ibis, Snowy Egret, Blue-winged, Cinnamon and Green-winged Teal, American Wigeon, Redhead, Wilson's Phalarope and Caspian Tern. Day 6 As well as many species seen previously, we may see Dusky and Olive-sided Flycatchers, Mountain Chickadee, Red-breasted and White-breasted Nuthatches and Pine Siskin as we head west into the Rocky Mountains again, this time into the Snowy Range. At Lewis Lake we will once more be at around 3000 metres. In the afternoon we will continue west to Rock Springs for a one-night stay. Day 7 Heading north, our first stop will be in the sagebrush country around the Big Sandy and Eden Valley Reservoirs, where Greater Sage-grouse, Sage Thrasher and Green-tailed Towhee can be found. Continuing north, our next stop will be at the New Fork and Green River Lakes. This is not only an extremely beautiful area but the birds are also excellent, with Black-headed Grosbeak, Fox Sparrow and Red Crossbill all possible. Eventually we will arrive at the town of Jackson, on the very edge of the Grand Tetons, for a four-night stay. Days 8–9 The Jackson Hole valley is undoubtedly one of the most beautiful places in the whole of North America. We will spend these two days visiting a number of sites both in the valley and in the mountains. There will be many new species to look for and these include Trumpeter Swan, Barrow's Goldeneye, Ring-necked Duck, Sandhill Crane, Clark's and Western Grebes, Long-billed Curlew, Broad-tailed, Calliope and Rufous Hummingbirds, Belted Kingfisher, Black-backed and American Three-toed Woodpeckers, Dusky and Ruffed Grouse, Western Tanager, Spotted Towhee and Brewer's, Yellow-headed and Red-winged Blackbirds. Taking the tram to the summit of Rendezvous Mountain, we will look for Black Rosy-finch and Rock Wren, while one evening we will search the forests for the magnificent Great Grey Owl. Day 10 Today will be the non-avian highlight of the tour, a visit to Yellowstone National Park and, in particular, to Old Faithful Geyser. There are not as many birds in the park as in the Jackson Hole area, but the mammals are easier to see and range from Bison, Elk and Moose to the possibility of Black Bear, maybe even Grizzly Bear. There could still be a few new birds to see, however, and these may include Harlequin Duck, Bufflehead, Mountain Bluebird, Cliff, Northern Rough-winged, Tree and Violet-green Swallows and Hermit and Swainson's Thrushes. Day 11 Sadly we will have to leave the Grand Tetons and head south again. We will stop at birding sites en route, including Seedskadee National Wildlife Refuge, where we will look for Great Blue Heron, California and Ring-billed Gulls and Forster's Tern. Near to our overnight stop we will visit the Flaming Gorge on the Green River where Bewick's Wren, Juniper Titmouse, Ash-throated and Grey Flycatchers, Woodhouse's Scrub-jay, Plumbeous Vireo, Black-throated Grey Warbler and Sagebrush Sparrow can all be found. Overnight in Rock Springs. Day 12 Continuing south back across the state border into Colorado, we will pass close to Dinosaur National Monument. Red-tailed Hawk, American Kestrel and Peregrine Falcon all occur in this arid and remote country. Along the Green River, Western Wood-pewee, Marsh Wren and Yellow-breasted Chat breed. We will continue south through more spectacular landscape, culminating in the Douglas Pass at 2520 metres, until we arrive at Grand Junction for a two-night stay. Day 13 Exploring the country to the south of Grand Junction, we will concentrate on two localities, Colorado National Monument and Box Canyon Falls, in Ouray. Species that can be found at the former site include Gambel's Quail, Black-chinned Hummingbird, Cassin's Kingbird, Bushtit, Blue-grey Gnatcatcher, Virginia's Warbler, Grey Vireo, Pinyon Jay and Black-throated Sparrow. Box Canyon is a speciality site for Black Swifts, which can be seen at close quarters on their nests and, with some perseverance, swirling overhead with the more common White-throated Swifts. Our last site of the day will be the Black Canyon of Gunnison to look for the rare and local Gunnison Sage-grouse. Day 14 We will head east across the great continental divide until we reach the road to Mount Evans which, at 4310 metres, is the highest road in North America. We will slowly walk the trail to the top (all of 19.5 metres in altitude!) looking for White-tailed Ptarmigan and Brown-capped Rosy-finch in case we missed either of them earlier in the trip and admiring the profusion of wild flowers. Returning to the main highway we will continue east. At Dillon Reservoir, however, we will take the Loveland Pass road, where we will experience our final Rocky Mountain birding before dropping down through five different life zones until we reach the mile-high city of Denver, where we will spend our last night. Day 15 There may be time for some local early-morning birding before returning to the airport for our afternoon overnight flight back to London, arriving on Day 16. General Information The climate can vary from very cold in the mountains to quite hot in the grasslands. There will be a moderate amount of walking, mainly on good trails, but at altitude this can be quite tiring. There are no special medical requirements and insects are not a major problem. Visas are required. Distances are quite long but the roads are good and driving is relaxed, with plenty of opportunities to stop for food and drink. Accommodation standards are good, with all motel rooms being spacious and having two beds, en-suite facilities and air-conditioning. Food is excluded from the tour price but is relatively inexpensive; allow about £20 per day depending on your requirements. Price includes economy scheduled return flights between London and Denver, all transport within the USA including tram ride, accommodation in twin-bedded rooms, entrance fees to National and State Parks and guiding services throughout. Excluded are food and drink, insurance, visa, gratuities and items of a purely personal nature.